In the early morning hours, at around 9:30-10:00 AM, we pick you up from the hotel. We begin our tour right from the first moment by moving towards the temple. As we cover the vicinities of Delhi, you will enjoy a flawless fusion of Old Delhi and New Delhi, from where we pass. Akshardham Temple is primarily built on the holy rivers of Yamuna. Depicting great Indian culture, this massive monument is one of the most impressive structures. It is simply majestic in appeal. With beautiful gardens, water fountains and carved pavilions, the impressiveness of this structure is great. You will be surprised to note that the temple includes nearly 20,000 statues, floral arrangements, and its alluring stone pillars are noteworthy in every sense of the term. One of the very first marvelous features of the temple is its assembly of ten grand gates. As they represent the ten principal directions of Indian culture, they are known for their exquisite beauty and appeal. Then there are two transcendent gates, one constitutes the 'Gate of Devotion' and another, 'twin peacock gates'. The major highlight of this feature is its marvelous structure standing at 141 ft. High Akshardham monument. We take you to the famous musical fountain, located at the center of Yagnapurush Kund. We also take you to the hall 1, ‘Sahajanand Darshan' or 'Hall of Values'. Hall 2 depicts the 'Neelkanth Darshan' forming a screening of a 40-minute film. Then comes the hall no. 3, which renders you a spectacular boat ride. Forming an oldest Vedic village and bazaar, it gives you immense beauty packaged in impressive form. 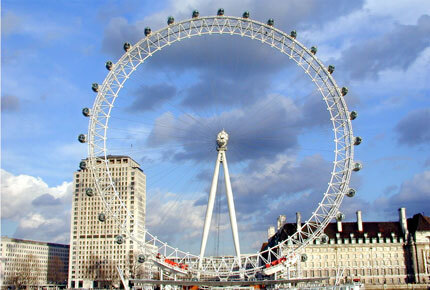 The tour concludes and you will never forget it as it forms the best destinations and attractions. 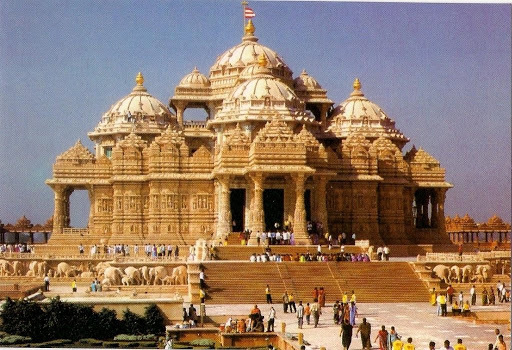 Make sure that you enjoy the same day tour of Akshardham temple without any hassles. You will be picked up from the hotel in the morning. We take you on a 2 hour drive making you reach Pushkar. You will be escorted by a guide in a private, air-conditioned vehicle. Pushkar is India’s one of the oldest cities. It is located on the shores of Pushkar Lake, which makes it immensely beautiful. As you arrive there, you visit Brahma Temple, which is built in the 14th century. You will be delighted to witness the outside and get enthralled with the marble and stone construction. When you enter the temple, you will notice the holy size image of Brahma. Thereafter, you get an opportunity to walk down to Pushkar Lake. It is indeed one of the holiest lakes in the country. It is your guide that tells you to serve as a bathing spot during Kartik Purnima, one of the festivals of Hindus. You will be delighted to see the pilgrims enjoying a ceremonial bath prior to entering the Brahma Temple. The traditional Puja is also being held every day. 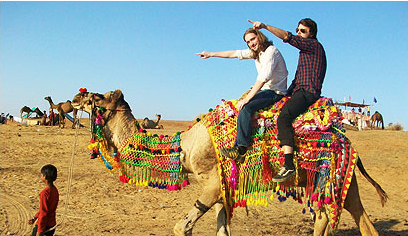 As your Pushkar day tour comes to an end, you will be returning to the hotel in Jaipur. At around 5 am in the morning we will leave the hotel and go to the railway station in order to board the super fast and air conditioned Shatabadi Express train. This is the time when Shatabadi Express train departs from Delhi. Breakfast is given on the board. After nearly 4 hours, you will be reaching the Jaipur city. 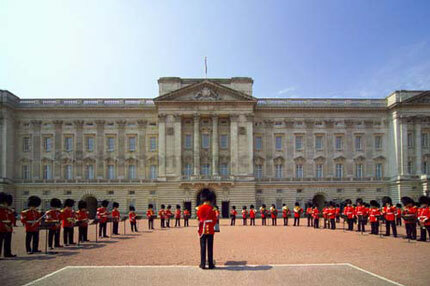 On the arrival we will be picking you from the hotel as you finish your freshen up exercise. We now move towards the city of Jaipur. We at Travelogy India Pvt. Ltd. Provide you a guide who assists you in everything. We also try to make your travel best and provide hassle free journey. 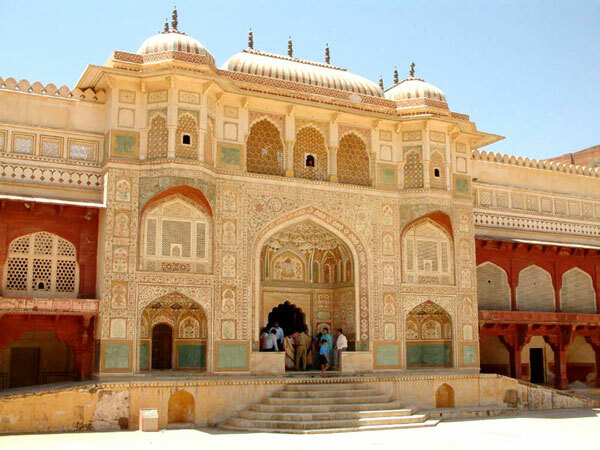 We also take you to the most famous monument, Amber Fort. It is indeed one of the most famous places in the vicinities of Jaipur. You also get to ride a painted elephant to hilltop fort. Get ready to witness the most beautiful attractions, the Fort Amer with its glittering Sheesh Mahal. We make your visit the architectural marvels and have our lunch buffet in a hotel where one can take a break and relax a little. We make you visit the popular City Palace Complex, Hawa Mahal, S.M.S Museum, Jantar Mantar, Jal Mahal and Rambagh Palace etc. This is the time when we take you back to the railway station for the purpose of boarding the train to Delhi. 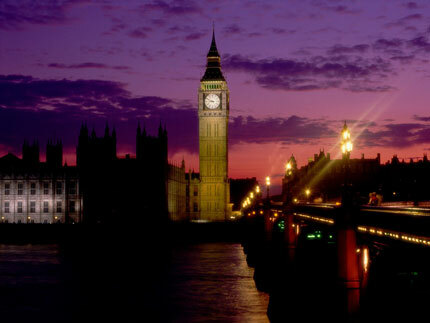 At this hour, the train departs and you are left with sweet memories of this place. Dinner is served in the train. As you arrive, you will be dropped at the hotel. The tour ends but not the sweet memories cherished with Ezee Holiday Pvt. 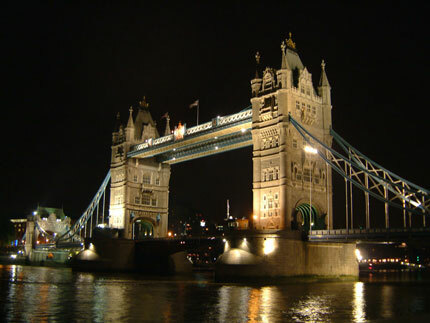 Ltd..
You will get loads of opportunity to visit the world's greatest monument of love and that too without any hassles. As the Taj Mahal stands magnificently in Agra, we at Ezee Holiday Pvt. Ltd. Make it an unforgettable experience for you. We do it with the help of a private car. As you travel by chauffeured air-conditioned vehicle between Delhi and Agra, you get an opportunity to enjoy personalized attention. It is one of the most enchanting experiences one could ever have. Early morning pick from the International Airport or from your hotel in Delhi and drive towards Agra located at a distance of 203kms. Upon arrival you will be met by your tour guide and then start your guided city tour of Agra by first visiting The Monument of Love – Taj Mahal (closed on Friday). Arjuman Banu the niece of Nur Jahan, at the age of 21 married Shan Jahan and took on the name that has passed through time: Mumtaz Mahal, the exalted of the palace. When she died, Shah Jahan was grief stricken and vowed to build her a memorial surpassing anything the world had ever seen in beauty and in the wild extravagance. He brought in skilled craftsmen from Persia, turkey, France and Italy. He put a huge army of 20,000 laborers to work, building a village ( Taj Ganj, which still stands) to house them. Taj Mahal - this huge mass of white marble resting on red sandstone is a jewel, fashioned over 17 years. The work ended on the exact anniversary of Mumtaz Mahal's death. Glimpsed from the enormous main gateway inscribed with verses of the Koran (the entire Koran is said to be reproduced on its walls), the Taj Mahal reveals with the suddenness of a jewel box opening before your eyes. After visiting Taj Mahal proceed to visit Red Fort of Agra. Red Fort - Ever since Babur defeated and killed Ibrahim Lodi at Panipat in 1526, Agra played an important center of Mughal Empire. Akbar chose this city on the bank of River Yamuna as his capital and proceeded to build a strong citadel for the purpose. It is said that he destroyed the damaged old fort of Agra for the purpose and raised this grand group of monuments instead in red sandstone. Started in 1565, it took eight years and thirty-five lakh rupees (3.5 million) to complete its construction and is second only to Taj in Agra. The Agra Fort houses the Royal Pavilions, which were designed to catch the cool breeze across the river. Other attractions comprise of the Macchi Bhawan or the Fish Palace, the Hammam-Shahi or the Royal Bath, the Nagina Masjid or the Gem Mosque, and the Zenana Meena Bazaar, where the ladies of the court would browse through goods like silk, jewelry and brocade, Diwane - Khas and Khas Mahal. After visiting the magnificent Fort visit to The Tomb of Itimad-ud-Daulah which follows a typical Mughal period mausoleum design. It is a square structure placed at the center of a garden in a charbagh layout, i.e. Square garden divided into four landscaped quadrants separated by paved paths with water channels running through their centers. At the end of each path is a red sandstone monumental gate structure with a high central pointed arch flanked by stacking arches. The gates vary only slightly in design, but all four are of the same size and contain similar geometric and floral designs created using white marble inlaid into the red sandstone of the façade. The east gate is the actual entrance into the mausoleum grounds, but the other three simply provide symmetry. The west gate provides panoramic views over the River Yamuna. After completing your city tour drive back to Delhi via express highway and then drop back at the International airport or your designated place of stay. Walking on the streets of Delhi is all about witnessing its rich historic past. With ample of archeological parks, Delhi is a city that has emerged as one of the most sought after destinations depicting rural urban connect. It is particularly due to the fact that the dynasties of 13th and 17th centuries laid down the foundations of seven cities in different parts of Delhi. One could get enthralled with diverse itinerary plans enchanting the tourists coming to the vicinities of Delhi from every nook and corner of the world. There are 1300 officially listed monuments in Delhi. Delhi, from a historical perspective, dates back to the 13th century. When excavations were done in the year 1955 at Purana Quila, it was found that the site is nearly 3000 years old. Pondering on its historic nature, we find that its painted gray ware industry nearly began in 1000 BC. Pondering on the excavations part we find that it also cut through houses and streets of the Sultanate with Gupta Saka-Kushan and Sunga periods. It will not an exaggeration to state that the city of Delhi is recognized for its historical legacies including Qutub Minar along with many temples. It was the Prithviraj who ruled Delhi and later on it was the Muhammad of Ghur who ascended the throne. Despite the controversial origins of Qutub Minar, one claiming that it signified the beginning of the Muslim rule in India while others saying a minaret to the muezzins, this monument is one of the most beautiful creations. 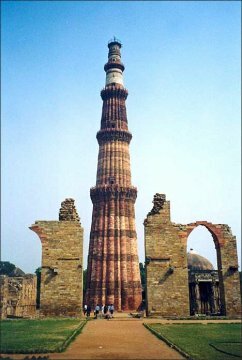 It was the Qutab-ud-din Aibak who commenced the construction of the Qutab Minar in 1200 AD. The successor Iltutmush also added three more storeys with Firoz Shah Tughlak and others. As the Red Fort is built with red colored stone, it is one of the most magnificent palaces in the world. It was the Bhadur Shah Zafar who marked the end of the three century long Mughal rule. It was the Shah Jahan, the Mughal Emperor, decided to shift to Delhi and for the purpose laid the foundation stone of the Red Fort in 1618. It is good to note that this building comes with a circumference of almost one and a half miles with an irregular octagon having two entrances, the Lahore and Delhi Gates. As we know that Mughals used to love gardens much, the culture of fountains and water was the residual effect. Humanyu’s Tomb is the first finest example of Mughal architecture in India. It was built by the emperor's grieving widow, Haji Begum, in 1565 AD. It was for the first time red sandstone was used in the building that marked the beginning of a new tradition of ornate style culminating in the Taj Mahal of Agra. It is designed by the Persian architect, Mirza Ghyas. The beauty is enhanced by the fact that it is located in the midst of a large square garden. As it is covered by high walls, it makes it the gateways to the south and west simply magnificent. Copper pinnacle tops the minaret. You could say that it is a gallery of modern art since this is what it appears at the first sight. Indeed an example of a modern art, this observatory is magnificent in every respect. It was the effort of Sawai Jia Singh II of Jaipur, 1699-1743, which made it possible for building the Jantar Mantar. Jantar Mantar constitutes the first of the five observatories built with large masonry instruments. The mosque, Jama Masjid was started being constructed in the year 1650. It was the Mughal Emperor Shah Jahan who complemented his palace at the Red Fort. With more than 5,000 workers who worked for six years in order to complete the largest mosque in India toiled into the soil to make it happen. The emperor, every Friday, would be travelling in state from the fort and would attend the congressional prayers. Indeed Jama Masjid is one of the finest examples of Mughal architecture. With 408 square foot main courtyard, it is paved with red stone. One could attend the prayers in the central. 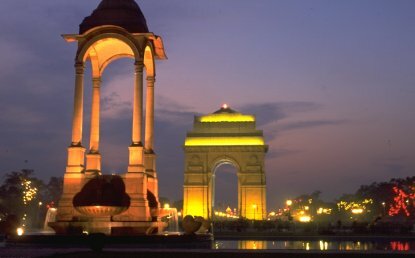 India Gate is one of the major tourist destinations in the Indian context. It was primarily built as a memorial to commemorate the 70,000 India soldiers killed in World War I it was designed by Sir Edwin Lutyens. As it is located on Rajpath, the road which leads to the magnificent Rashtrapati Bhawan, it is one of the most impressive places in Delhi. Rajghat is recognized for the mortal remains of Mahatma Gandhi, the father of the Indian nation. It was in the evening of January 31, 1948 when Mahatma Gandhi was cremated. One could see the last words, 'Hey Ram' (Oh God) engraved in a garden with fountains and a variety of exotic trees.